The United States has set minimum conditions — predicated on far-reaching reforms — that President Emmerson Mnangagwa’s administration must meet if it wants improved diplomatic relations and access to international assistance and cooperation, the Daily News can report. After sweeping to power last month with the aid of the military, Mnangagwa had made known his intention to mend broken fences with the international community, unlike his predecessor Robert Mugabe who had burnt bridges with Britain and her allies in the West. 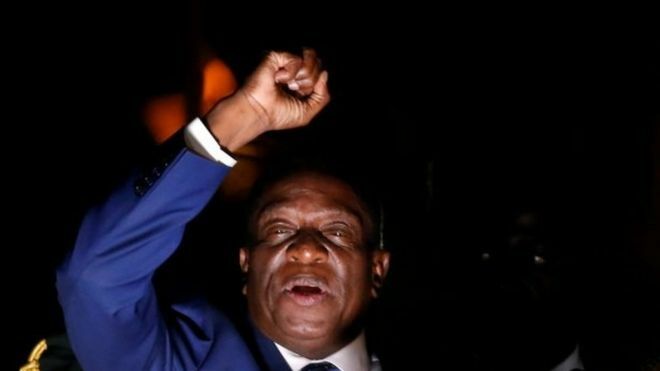 Mnangagwa said whatever misunderstandings may have subsisted in the past, these should make way to a new beginning, adding that “in this global world, no nation is, can, or need be an island, one unto itself”. But on Tuesday, Washington pronounced itself clearly in the wake of the change in guard at Munhumutapa Building — the seat of power in Zimbabwe. In remarks indicative of Washington’s skepticism of how relations would improve, given that Mnangagwa is a close ally of Mugabe, and been accused of atrocities dating back to the 1980s, Washington said troops deployed under Operation Restore Legacy must return to their barracks and State institutions should be demilitarised. US Senate Committee on Foreign Relations’ principal deputy assistant secretary for the Bureau of African Affairs, Stephanie Sullivan said re-engagement with Mnangagwa’s administration will be based on demonstrated behaviour, not rhetorical intentions. “Our policy of re-engagement will focus on constitutional democracy, free and fair elections, respect for human rights and the rule of law, and an improved trade and investment climate, among other issues. “The country has a strong civil society and experienced political opposition, and their voices must count in charting a path forward. “We must judge the new administration on its current and future actions. Along the way, there will be many actions that we will need to assess, as we look to reengage. We will need to see free and fair elections. The military needs to return to its barracks and State institutions should be demilitarised,” said Sullivan. This comes as an MDC Alliance delegation led by former Finance minister Tendai Biti delivered a moving testimony before the Senate Foreign Relations Subcommittee on Africa and Global Health policy in Washington DC on Tuesday. Biti, president of the People’s Democratic Party, was accompanied by Welshman Ncube, MDC president; Nelson Chamisa, MDC-T vice president and Jacob Ngarivhume of Transform Zimbabwe. Author and Zimbabwean journalist, Peter Godwin, was also part of the panel. Sullivan said perpetrators of abuses against civilians should be held accountable regardless of party affiliation, calling on government to “engage in hard economic reforms, including addressing budget deficits, reforming the Indigenization Act, and reducing corruption”. “We believe critical political reforms deserve equal attention and cannot wait. In particular, elections must be free, fair, credible, and inclusive allowing Zimbabweans to choose their own leaders. Everyone in Zimbabwe should enjoy the rights to peaceful assembly without undue interference and to voice their opinions — and their vote — without fear,” she said. Biti’s delegation had been invited to Washington by the State Department to appraise the Americans on the situation in Zimbabwe. Chris Mutsvangwa, special advisor to Mnangagwa declined to comment, referring questions to Foreign minister Sibusiso Moyo. Moyo was not immediately reachable for comment. Biti’s delegation has upset some members of the ruling Zanu PF party, who suggested that they should have been included in the panel. Zanu PF activist, Frenk Guni, was quoted saying, “We know that they are here to urge the government to maintain targeted sanctions imposed by the West on members of our party. The US imposed targeted sanctions on Mugabe and his inner circle for alleged human rights violations and electoral fraud. Todd Moss, a former deputy assistant secretary of state for African affairs and a senior fellow at the Centre for Global Development wrote this week that the long-term survival of any new Zimbabwean government will depend on resolving the country’s cash crisis and reviving the economy. “But Zanu-PF has shown a remarkable ability to resist reform, even under the most trying of circumstances. Just as Mugabe inexplicably clung on to the bitter end, the looting machine he is leaving behind may keep on running, regardless of the cost,” he opined. The Zimbabwe Democracy and Economic Recovery Act, passed with bipartisan support in 2001, sets out strict conditions for US re-engagement, including the lifting of targeted sanctions and debt relief. Mnangagwa and Zimbabwe Defence Forces commander, General Constantino Chiwenga are still listed among the roughly 200 individuals and entities sanctioned by the US Treasury Department. To have their assets unfrozen and their ban on doing business with Americans lifted, they will need to convince US officials that they are no longer undermining democracy and the rule of law. The US also has significant influence over the terms of any future debt restructuring or new loans. For the last two years, Washington has resisted British attempts to arrange a financial bailout for Mugabe.